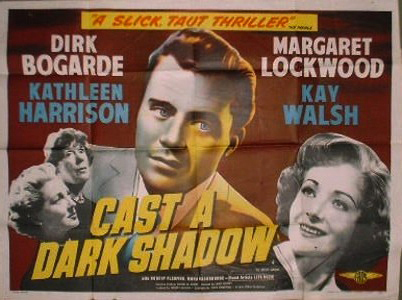 Cast a Dark Shadow has an excellent beginning and doesn’t really miss a step thereafter. The first shot shows a woman in her late middle age screaming; it turns out that she is on a ride in a fun-house’s ‘hall of horrors’. The camera then shows the much younger man sitting next to her, staring unblinkingly at her. We know immediately that the monster of whom she should be terrified is right beside her. 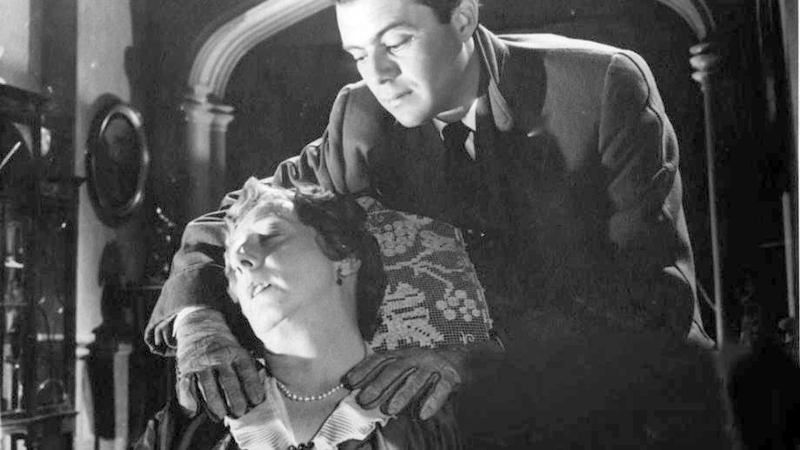 Dirk Bogarde gives a wonderfully layered performance as Edward, a young fellow on the make. His plan to get ahead is to kill his susceptible and wealthy older wife, Molly (Mona Washbourne), in order to inherit her wealth. But there is no perfect crime in fiction, any more than in real life, and Mona has accidentally foiled Edward’s scheme. Hoping to have her money come to him simply by virtue of their marriage, Edward murders Molly when she tells him she intends to write a will. A misunderstanding makes him think she will leave everything to her sister, when she wants to leave everything to him. Her death at his hands keeps her from writing the will he would have wanted. While a number of elements in Cast a Dark Shadow are interesting, the most intriguing are the character of Edward, and Bogarde’s performance. This is not a cardboard villain. The first time we see him, we note his obvious wickedness. But then we see a brief reaction after the murder. He is not as cold as he first appears. And was that initial glare at Molly in the fun-house one of contempt or pity? At one point, Edward states that Molly was the only one who understood him, and there is no reason for the viewer to doubt this belief. In fact, it may be that it was only with Molly that Edward had ever been or would be happy. Yet, even with this possible realisation, he would not be turned from his evil goal. The character of Freda (Margaret Lockwood) is almost as well written and played. She is as sharp as Molly was blind to what people can be. She thinks she knows Edward’s type and, as she shares some of his characteristics, is not put off by him. How well they are matched, and how well their respective expectations are met, or not met, may be gauged when one confesses feelings for the other, to which the latter’s response is, “Well, we didn’t see that coming, did we?” in a combination of surprise and amusement. While the acting and writing take pride of place in Cast a Dark Shadow, the direction is good, as well. The first scene in the fun-house, already mentioned, is very suggestive. The direction is, in fact, quite leading, giving signs of what the director wants us to think or feel, rather than showing it more overtly. Molly’s presence is almost palpably felt by Edward; he not only apostrophises her throughout the movie, as if she were still alive, indeed, watching his progress, but often sets her now empty chair rocking, as if she were in it. 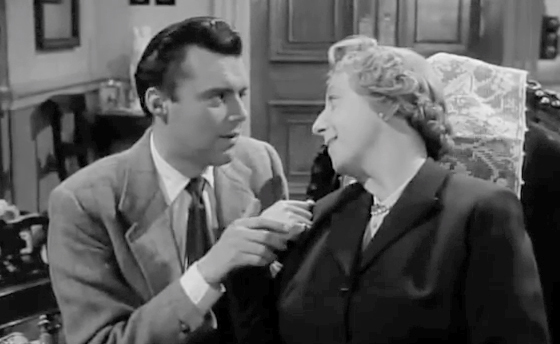 There is also a scene in which Edward and Freda pick flowers, his assurance that it is safe to do so in conflict with a sign posted that clearly reads ‘Danger’. This is not so obvious a shot as it may seem; it is not a matter of Freda being oblivious to the hazards Edward represents, but rather of how she can live with them when the signs that indicate otherwise are all around her. 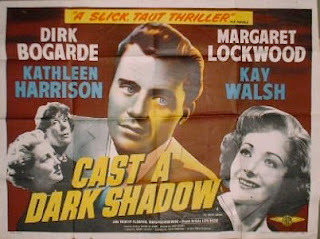 Cast a Dark Shadow has a few weak points, but not enough to cancel the appeal of this thriller, a good example of British film noir. British movies, especially those from the 1940s and '50s, get short shrift in North America, I find. I saw that one on TV awhile back, and quite enjoyed it. I'm not sure if it was intended that way, but I found the ending darkly humorous. 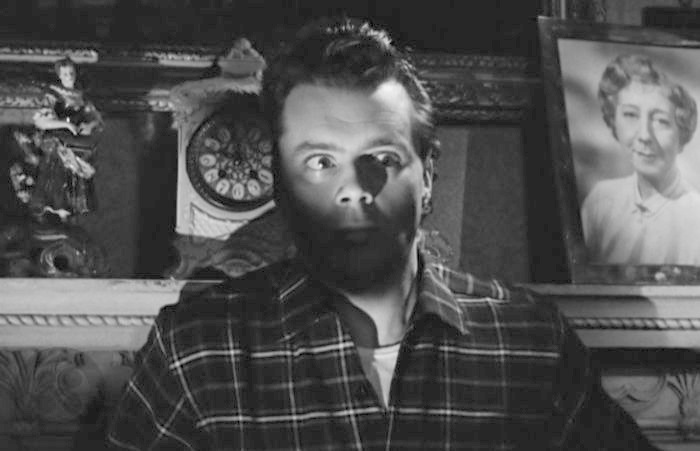 (The better examples of film noir sure had a way with "Oops!" moments.) I was a bit surprised to learn the film was a flop when it came out. I think we were meant to smile a bit at the way in which justice was served. 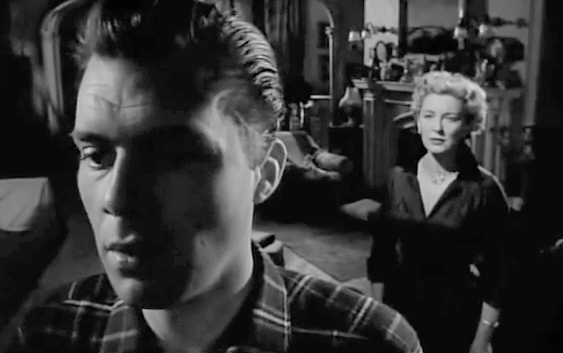 Films noir did indeed like to do that sort of thing.